Some liberal groups hoped the Congressional Progressive Caucus would take an aggressive stance toward party leaders. But co-chair Rep. Pramila Jayapal, of Seattle, is picking her battles as she seeks first to work with Speaker Nancy Pelosi before throwing bombs. U.S. Rep. Pramila Jayapal, D-Wash., a leader of more than 90 liberal House lawmakers, could have tried to throw up roadblocks to Nancy Pelosi’s speakership bid. She didn’t. She could have joined new liberal icon Rep. Alexandria Ocasio-Cortez, D-N.Y., in trying to sink a House rules package some advocates warned would hinder liberal priorities. She didn’t. And when bipartisan negotiators announced a budget deal in mid-February that ignored Jayapal’s pitch to rein in immigration-enforcement policies she has dedicated her adult life to protesting, the second-term lawmaker could have tried to derail the package. She didn’t. Emboldened by the energy on the far left and the Democratic takeover of the House, some liberal groups hoped the Congressional Progressive Caucus would take an aggressive stance toward party leaders — borrowing a page from the playbook of the conservative House Freedom Caucus, which forced GOP leaders’ hands at almost every turn in recent years. The thought is that only hard-line tactics would help liberals trigger action on issues like Medicare-for-all, the Green New Deal, free college and banishing corporate money from politics — ideas that are a step too far for moderate-minded Democrats and the House leadership. But Jayapal, who serves as caucus co-chair, so far is picking her battles carefully as she seeks to first work with Pelosi to advance her causes before resorting to throwing bombs. Just before Christmas, the Freedom Caucus played a central role in pushing President Donald Trump into a 35-day partial government shutdown to try to win funding for his border wall — a move that polls showed was unpopular except in the most secure red districts and that irritated House Republican leaders. With the same potential power in her hands two weeks ago, Jayapal said she never considered whipping votes against a funding bill to keep the government open, even though it contained provisions she opposed. When some of her colleagues started a rumor that she was working to sink the deal, Jayapal grew angry. At a hastily arranged caucus meeting, she fought back tears as she stood before a room full of her liberal peers explaining her “no” vote. Jayapal had worked with House Democratic negotiators for days to no avail, trying to curb immigration detention beds. But she was also unhappy with the whispers suggesting she was flirting with trying to force a government shutdown to get her way. Jayapal’s concern stands in stark contrast to the burn-the-House-down strategy relished by conservative lawmakers in the House Freedom Caucus, who cared little for camaraderie and never worried about making enemies with colleagues. Rep. Mark Meadow, R-N.C., who led the hard-core conservatives, seemed to delight in his ability to keep GOP leaders on edge. 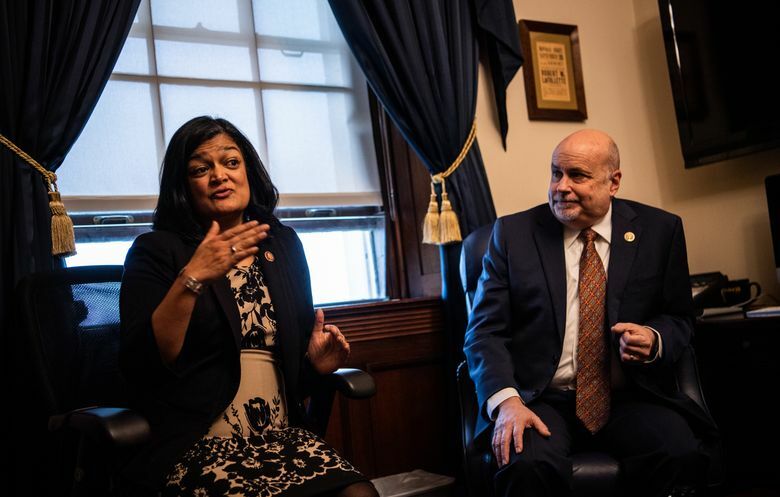 Jayapal said she is ready to fight when needed, but argued that having good relations with leadership and fellow House Democrats will be key to liberals achieving their goals and allows the progressive caucus to use its leverage when needed. Her strategy is working, she argued. For instance, when Pelosi’s office was phoning outside groups, seeking to boost public support for her speakership bid after the midterm elections, Jayapal and her caucus co-chair, Mark Pocan, D-Wis., persuaded their liberal allies to hold off until the caucus could secure concessions from the longtime Democratic leader. Pelosi eventually agreed to give liberal lawmakers more slots on coveted committees and in leadership. Jayapal then endorsed Pelosi and pitched her to the newcomers as a fellow liberal. A few weeks later, when leadership came to Jayapal for help moving a House rule that included an obscure budget provision some liberals disliked, Jayapal worked Pelosi for the promise of a hearing on Medicare-for-all, legislation Pelosi has notably steered clear of endorsing. She got it — then helped leadership ensure Ocasio-Cortez’s protest wouldn’t upend the rules package. Still, some liberal outside groups want to see the caucus take a harder line. They privately question whether the group would be willing to buck Pelosi to advance ideas they champion. And some advocates are openly talking about the need for a smaller, more hard-line “sub-caucus” that would vote en bloc to win concessions — a proposal Ocasio-Cortez floated last year. The grass-roots group Indivisible, which meets with Jayapal every few weeks, has circulated a memo to incoming liberal freshmen about how to create the “Freedom Caucus of the left,” according to one person who has seen it. Others just want Jayapal to clean house to ensure her members are truly dedicated to liberal values. Even as Jayapal bats down suggestions that her caucus should take a page from the Freedom Caucus, she has been working behind the scenes to address the source of some criticisms. In January, she and Pocan charged a small caucus task force with brainstorming rules to bind caucus members on votes and to ensure they hold firm on liberal policies. “We will only get stronger as we flex our muscles,” Jayapal said. But the reality is the outcome isn’t entirely Jayapal’s decision. Her caucus includes 40 percent of the entire Democratic caucus and includes lawmakers with vastly different backgrounds. Getting everyone to agree on a position could prove difficult. That’s why some liberal critics of the group want a shake-up. They note that some of the caucus members also belong to the moderate-minded and business-friendly New Democrat Coalition. “There are serious questions about the CPC as a force, although I do think it is stronger now than it’s ever been,” said Justice Democrats spokesman Waleed Shahid, who said he would like to see the group vote together more often and add a requirement that CPC members back a specific list of policies. Jayapal is working on both. It’s a matter of time before her caucus and Democratic leaders clash over policy, she said. With their massive Twitter followings and their eagerness to snap back at critics on social media, Ocasio-Cortez and some of her fellow liberal freshmen lawmakers receive the most national attention. But in the halls of Congress, Jayapal is respected by colleagues as an authority on liberal policies. Born in India and raised in Indonesia and Singapore, she migrated to the United States at 16 to attend Georgetown University and then worked for several years in the finance industry. After helping a friend on an economic development project in Chicago, she found her calling and switched careers to focus on helping vulnerable communities. After the Sept. 11 terrorist attacks, Jayapal founded Hate Free Zone, now called OneAmerica, to advocate for immigrants who face discrimination. Her organization sued the Bush administration, successfully stopping the deportation of thousands of Somali immigrants. After a brief stint in the Washington state Senate, Jayapal ran for Congress in 2016 and quickly rose in the ranks. She’s garnered headlines for protesting Trump’s immigration policies, backing controversial proposals such as “Abolish ICE” — a push by liberals to get rid of or restructure the U.S. Immigration and Customs Enforcement agency. Jayapal’s résumé — plus her three civil-disobedience arrests at protests — have won her street cred with the incoming freshman class. Rep. Lucy McBath, D-Ga., a gun-control advocate who ran for Congress after her unarmed son was shot and killed, refers to Jayapal as “the mother hen.” And the new members frequently come to her for advice. When the bipartisan budget deal was unveiled, for example, liberal Reps. Rashida Tlaib of Michigan, Ayanna Pressley of Massachusetts, Ilhan Omar of Minnesota and Jahana Hayes of Connecticut visited Jayapal’s apartment to talk strategy while the Indian American cooked chana masala. During a recent House Judiciary Committee hearing, Jayapal helped several freshmen navigate panel rules in responding to their GOP colleagues. Her ability to keep the support of the most high-profile members of the freshman class while maintaining influence with leadership will be a major factor in whether she’s a successful leader. Others, however, want more. And that tension is likely to crescendo in the coming weeks, possibly during the caucus’ rollout of its Medicare-for-all bill this week. Pelosi promised Jayapal the single-payer idea would receive hearings on the Rules and Budget committees. But the speaker has refused to green-light a floor vote or even a hearing in the powerful Energy and Commerce Committee. Some liberals argue the caucus should push harder for both, particularly since nearly every 2020 presidential candidate is endorsing Medicare-for-all. Betraying her pragmatic streak, Jayapal argued that liberals need to build the case with their skeptical colleagues rather than force the issue now. That’s why she and Pocan have commissioned polls in swing districts around the country, highlighting findings she says show that even moderate districts support some liberal policies. “Three years ago, everyone said $15 minimum wage was impossible. Now that’s a leadership-embraced bill,” Jayapal said. Jayapal has agreed with some recent criticism of her group. The caucus recently came out against a GOP amendment that critics said watered down a resolution rebuking Saudi Arabia for mass killings in Yemen. Several caucus members backed the amendment anyway, surprising some of their colleagues. Outside advocates point to this example to argue the caucus needs to crack the whip on its own membership — or create what Alex Lawson, a prominent liberal advocate who leads Social Security Works, called a smaller “hard-core subset within the CPC” that votes together. But the idea of doing something similar has yet to pick up much support among caucus members.